Lyndsay Johnson: "I'm a beautiful reflection of my Love's affection..."
"I'm a beautiful reflection of my Love's affection..."
I am 35 weeks and 3 days along (at least that is what my little sidebar ticker graphic says, so I am going with that). I spent all morning describing the most annoying and sometimes excruciating upper abdominal pain that I am experiencing to my doctor. I had the same thing with Finn. "It's under my right rib...it burns, no it feel like ripping...or a knife..." Great. "Well, Lyndsay, we have no idea what this is." Double Great. But since the pain is so much worse with this pregnancy, they did blood work today and an abdominal sonogram Monday (not to see baby, but to see kidneys, liver, gall bladder—which were all free and clear last time they did this 2 years ago). They prescribed some pain medication that is non-narcotic and will get me through until they figure out what's going on in there. But! It's on order until Monday. Oof. Tough it out a few more days. But Baby Girl is doing grand. She is fussing and squirming, getting too big for her little nest. She seems to be totally unaware of my discomfort. And I am reminded of this every time she sticks her little toes right up into my ribs. Double Oof. i can't believe how fantastic you look! You ARE lovely! And sorry for the pain. Having doctors not be able to relate to your pain (or even explain it!) is one of the pains of pregnancy. Hey, did they check to see if one of your ribs is...er...cracking under the strain? That happens, sometimes, I've heard. Good luck! Thanks for the information for my little guy. He seems to be getting much better. 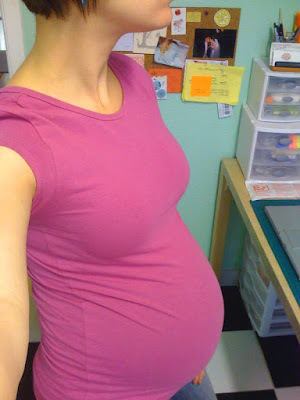 Don't you love going for your pre-natal check-ups? After describing all your pains and problems they tell you --oh that's normal. I think--Thanks! I so feel u on the discomforts! I am waddling around like a penguin and I can hardly sleep anymore! The heartburn! Ugg..all for a good cause, right? Just think, we are closer to the finish line! Yay! You are the cutest little pregnant woman ever! Oh...new name...can't wait for the reveal and baby girl's arrival! You look cute as a button! We changed our babys name at 6 weeks. She originally was a Margot, but everyone pronounced the "T" (lame!) so we changed it to Kate- LOL! Can we hear the OLD name? I had to comment -- I had that rib pain, too! It was bad with my first and worse with my second. Then, it came back six months later when I was not pregnant. I'm not sure if it's the same thing that you have, but it sure sounds identical to my symptoms. I had every test in the book including ultrasounds of my heart and an MRI. It turned out to be costochondritis. The combination of the baby pushing everything up into your ribs and your looser joints causes ribs to rub which causes inflammation. The inflammation in turn causes the ribs to sort of shift out of place and pinch nerves. It's a bad cycle. I finally saw a really great chiropractor who realigned me and has me doing exercises to strengthen my upper back so that my ribs stay in place. Good luck! You look amazing!